The undisputed second-best team in CONCACAF isn’t flying under the radar anymore, not after a 2014 World Cup appearance that saw Costa Rica win a deadly group that included Uruguay, Italy, and England, then make a quarter-final run that was only stopped by a penalty shootout loss to the Netherlands. Almost all the players who brought that success to Costa Rica are back for 2018, with one more chance to cover themselves with glory before handing the reins to a new group of youngsters tasked with maintaining the momentum. Before 2002, Costa Rica had only appeared in one World Cup: the 1990 tournament, during which they scored wins against Scotland and Sweden before losing in the Round of 16. The national team was consistently solid in the mid-20th century, but with a limited number of qualifying spots for the Western Hemisphere (only 16 teams competed at the finals until 1982, most of them European), regular finishes behind Mexico meant a lack of opportunities on the world stage. And by the time CONCACAF began receiving more slots, Costa Rica’s peers like the U.S., Canada, Jamaica, and other Central American teams had caught up. In the 21st century, however, Costa Rica have made it to every World Cup except 2010’s, and have finished second in CONCACAF both of the past two qualifying cycles. The generation that came out of the 2010 failure—including Cristian Bolaños, Bryan Ruiz, and Keylor Navas—continues to form the backbone of this squad. Those guys have brought the country to new heights and, along with those heights, new expectations. This Costa Rican roster has seen barely any turnover in the last four years, which gives them experience and camaraderie at the expense of the kind of athleticism usually only young bodies can provide. Their run in the 2014 tournament was a heroic feat, and hoping for a repeat performance from an older squad isn’t exactly the safest bet. But while Brazil should win Group E easily, second place remains wide open for Serbia, Switzerland, or Costa Rica to take. If Los Ticos are going to advance, it’ll be experience and pragmatism that carries them through. By limiting their goal difference against the Group E favorites and avoiding a loss to their other two opponents, Costa Rica can squeeze a few more memorable moments out of this golden generation. This is the final run for a special roster, and even if they can’t make it to the knockout round this year, the history they’ve made in Costa Rican soccer will forever be safe. After Jorge Luis Pinto, Costa Rica’s manager for the 2014 World Cup, left the Ticos for the Honduras job, Ramírez was not Costa Rica’s first choice to take the vacant gig. The first man hired to replace Pinto was actually Paulo Wanchope, who held the all-time Costa Rican international goal record when he retired as a player in 2008. Then, as happens sometimes, Wanchope had to resign after brawling with a steward at a U-23 game, and his just-hired assistant found himself at the helm. Ramírez is also a Costa Rican legend, part of the famous 1990 World Cup squad, and throughout his three-year tenure as manager he’s stayed calm and hasn’t rocked the boat. He’s defensively minded, plays many of the same players that Pinto did, and keeps them in the same system. If you forget about that one crazy fight, the continuation from 2014 to 2018 has been smooth as can be from a managerial perspective. As the starting goalkeeper at a gigantic club like Real Madrid, Keylor Navas might face some critics who wonder if he’s really good enough for the three-time reigning European Champions. But on the CONCACAF level, he’s nothing short of a diety, almost single-handedly turning Costa Rica into one of the hardest teams to beat. And with the never-ending pressure of Madrid now a normal part of his life, the World Cup won’t be any more intimidating than usual for the star of Los Ticos. 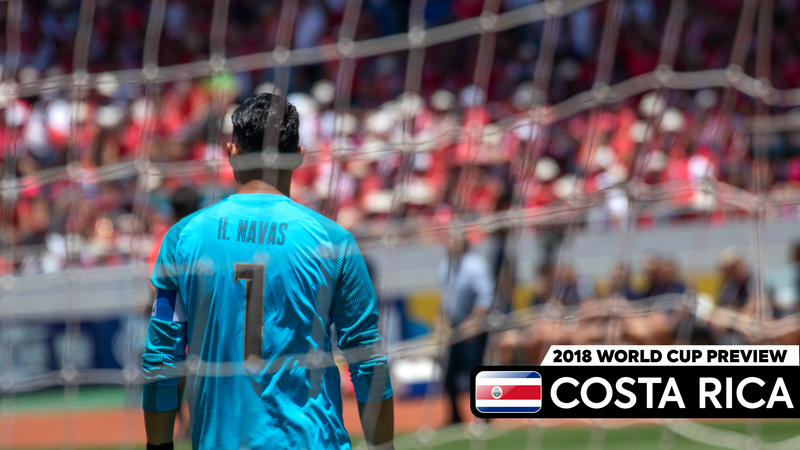 It’s generally considered a bad sign when a team’s best player is its keeper, but in the case of Navas and Costa Rica, it’s easy to see how much of a godsend his presence is. Navas is the anchor of the defense and the beginning of the offense, the one who blocks opponents’ shots in one moment and in the next starts the process of creating shots for his teammates with his quick and sharp distribution. He’ll be asked to save pretty much everything that comes his way, as it’s difficult to imagine Costa Rica scoring more than two goals (at most) in any game with their limited offensive resources. But Navas will be up for the challenge. For any sad American fans looking for something approximating Tim Howard’s 2014, Navas your man. He won’t be enough to take Costa Rica anywhere near the final of this tournament, of course, but as the first-ever keeper to win three straight Champions League titles, his trophy case is already pretty crowded as it is. Costa Rica line up in a 5-4-1 (or 5-2-2-1) formation and pack it in with plenty of defensive players, making them difficult to score against but rarely particularly threatening on the attack. Los Ticos are far more likely to get pinned back in their own zone than control the game themselves, and even when they can break out on the counterattack, their lack of speed means their attacks cut more like a butter knife than a Ginsu blade. But even before the ball gets to Keylor Navas in goal, Costa Rica play strong defense, as the United States learned in their combined 6-0 losses in their two qualifying games. Costa Rica aren’t passive when the other team has possession. Instead, the defensive line works to set offside traps and force turnovers and send the ball back across the pitch where their few attacking players and possibly the overlapping wingbacks can try to create a scoring opportunity of their own. This is a frustrating team, not a beautiful one, and while they’re vulnerable to speed and could get absolutely crushed by Brazil, the less talented teams in their group will have to be cool-headed and perhaps a bit lucky to find a way past this very tough squad.